Great Walking Safari Ngorongoro Highlands 7 Days is a tour will takes you to visit and explore Ngorongoro highlands with a Crater game drives. 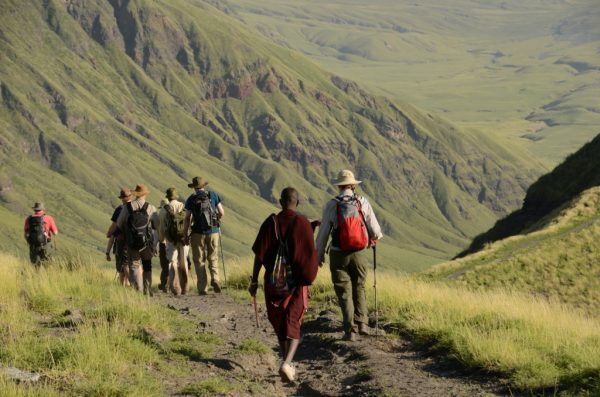 On great walking, you will have 3 nights in the highlands of Ngorongoro conservation area at the special camp sites and the other three nights outside conservation boundary at the base of Oldonyo Lengai Volcano Mountain and at Lake Natron. All the camp sites will be fixed with comfortable canvas Tents, while donkeys are included in the number of the crew to help carrying the stuff, this is very interesting. This 7-day trekking tour takes you to the diverse landscapes of the Ngorongoro Crater Highlands – Ngorongoro,Olmoti and Empakai. The trek will give you , above all, the greatest sceneries on earth you will never imagine they exist. It is such a breathtaking hiking through the wide grass and mountainous countryside as well as thick mountain forest and the volcanic stamped savannah landscape of the Rift Valley. Next to the unique nature and animal sightings, this trek allows a deep insight into the daily routines of the Maasai. Depart form Arusha at 9 am. Drive to Ngorongoro Conservation area for an afternoon game drive. It will be a perfect timing for our exquisite lunch. Thereafter proceed to Ngorongoro crater for a half a day afternoon drive. The crater hosts Africa’s most abundant wildlife, amazing panoramic views as we descend the crater and the Big Four. Late in the afternoon we drive to Nainokanoka village for camping before dinner and overnight. A walk around the Olmoti crater rim having a magnificent view of the Olmoti Craters’s floor a shallow and covered with tussocks of grass. Besides the Maasai and their livestock you can sometimes see eland, buffalo and reedbuck. We can also visit the Munge waterfalls formed from the Munge River originated from the waters of the Crater walls, crossing the caldera and plummets down over cliffs, falling some hundreds of metres into the steep-sided ravine below. DAY 2 Walk to Kamnana Village. Walk through the Embulimbuli Depression a shallow, grassy basin formed where the slopes of Olmoti, Empakaai, Lolmalasin and Losirua volcanoes join with the outer rim of Ngorongoro. After breakfast we walk through the Embulimbuli Depression a shallow, grassy basin formed where the slopes of Olmoti, Empakaai, Lolmalasin and Losirua volcanoes join with the outer rim of Ngorongoro. The trails pass through forests and grasslands. Like the similar Malanja depression to the west, it probably collects and provides a sink for a good deal of water that appears lower down at the foot of the mountains. Following the cattle trails to Kamnana village where we will overnight and have dinner. The caldera is about 6 km wide and nearly half of its floor is covered by a lake. The water in the lake is alkaline and the depth of the lake is about 85m, unusually deep for soda lakes in East Africa. The steep walls of the caldera, clothed in forest.Following the path through the open grassland, bushland area and forests gradually ascending the Empakaai crater rim, before descending in to the crater floor. At the rim you have a fantastic view in the craters’ green paradise. The caldera is about 6 km wide and nearly half of its floor is covered by a lake. The water in the lake is alkaline and the depth of the lake is about 85m, unusually deep for soda lakes in East Africa. The steep walls of the caldera, clothed in forest, rise in some places to almost 300m above the floor. The views along the trail downwards are spectacular at every point. All along you can enjoy the changing views of Empakaai itself. In addition, from the northern and eastern side you can look out to the dramatic cone of the still active volcano, Oldoinyo Lengai. If the day is clear, you can look beyond Lengai to the Great Rift Valley and Lake Natron. Sometimes you can even see the distant snows of Kilimanjaro far on the eastern side of the Valley. The evening is spent relaxing or visiting the village school and also interacting with the friendly local Maasai people. After breakfast we depart for Naiyobi maasai village circling the crater rim, descending on the North western side.The trails leads to Naiyobi Maasai Village which we can arrive late noon. The evening is spent relaxing or visiting the village school and also interacting with the friendly local Maasai people. Overnight camp at the Acacia trees forest near the village. Early morning we leave before the sun gets too hot, following the winding path across bare volcanic rocks and dusty lava soil, crossing Ngaresero river rounding the north-western floor of the active Mt. Lengai to the nearby village. Camp is set near the river and a bath here is very refreshing. Early in the morning (between 3.00 a.m. and 4.00 a.m.) your will be transferred to the foot of »the Mountain of God«, Ol Doinyo Lengai mountain, to start the trek. It is the only active volcano in East Africa with the most current eruption in 2007. It is one of the few volcanoes in the world to omit Sodium carbonate and potassium, whose run off accounts for the extremely alkaline and corrosive swill of neighbouring Lake Natron. For photographers, the perfectly conical shape is delightful to see, especially if you can get Maasai cattle herders in the foreground. The weird perilous sight of magma flows bubbling at 510 degrees Celsius on top leave the tourists astonished. After breakfast drive with picnic lunches to Lake Natron. Expect to see vast shallow soda lake and a white carpet of soda and salt crystals cracked in to a polygonal patchwork. Evidently seen are the built flamingo nests resembling miniature volcanoes. It is a bizarrely beautiful breeding ground and home to thousands of Flamingos feeding on the blue algae. Much to see are wildlife like Zebra, wildebeest, gazelle, ostrich, fringed eared Oryx, lesser kudu, gerenuk and golden jackal. You may also be amazed too see volcanic implosion crater, ravines containing nesting sites for Ruppels griffon vultures and several waterfalls. Swimming is also possible and a visit to Maasai bomas a walk up the escarpment the best way to end a perfect day. After lunch drive back to Arusha. – Extras at the lodges i.e. drinks, telephone, laundry, Internet etc.